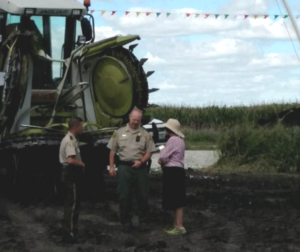 Cyndy Coppola blocking construction on her long-time family farmland taken by eminent domain. Join us on Thursday, Dec. 15 to stand in court with Iowa landowners who are battling eminent domain for private gain and have refused to sell their land for the Dakota Access pipeline. The court will also hear Sierra Club Iowa Chapter‘s challenge of the Iowa Utilities Board’s decision to issue a permit for Dakota Access to construct a hazardous liquid pipeline across Iowa, because they did not show the pipeline was necessary to serve the public; the impacts to the environment and the dangers of oil spills are reasons that the permit should not have been granted; and the IUB ignored the impacts of climate change. We’ll meet briefly outside the courthouse starting at 8:00 a.m., before going inside to stand with landowners when the hearing beings at 9:00 a.m. When entering the courthouse, you will pass through a metal detector. No weapons are allowed, including knives of any kind. Signs are not allowed, but Pipeline Fighter t-shirts are okay. Unfortunately, the court does not have a room available for overflow. Those who do not get a seat inside the courtroom will be waiting in the hallway, and there will be no audio or video broadcast of the proceedings. Courtroom etiquette: No chanting or disruption during the hearing. This could result in being asked to leave or possibly sanctioned. Recording audio or video is prohibited. Before the hearing, Bold Iowa will host community meetings on Dec. 10 in Newton, Storm Lake and Grinnell, to provide an update on the issue of eminent domain and Dakota Access, and preview the arguments that farmers and landowners will make at the Dec. 15 hearing. Please RSVP on the form below. RALLY: 11:30 a.m. – 12:30 p.m.
RSVP: RSVP on the form below so we know you’re coming. SHARE: Click here to share the event on Facebook. WHEN: Saturday, Dec. 10, 10:15 a.m. – 12:30 p.m.